I’m not the kind of girl who “juices.” You won’t find me cleansing for a week or saving up to buy a $600 Vitamix for my morning meals. With a tree nut allergy and tendency to get heartburn from raw veggies, my mornings generally start with eggs on a healthy day or a naughty pastry when I’m in need of a splurge. Post-workout, I find myself craving something protein packed, but light in both flavor and calories. Because who wants to un-do all the hard work they just put in at spin class? That’s where deliciously cool and sweet smoothies come in. 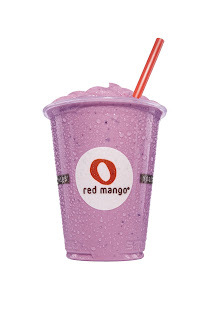 Red Mango, a chain of natural frozen yogurt stores, with locations all over NYC, has introduced a new line of smoothies for a healthy snack or meal after a serious sweat session. These new summer smoothies are all natural, full of healthy probiotics and patented superbiotics and blended with sweet fruit and fresh juice. Body Balance - Functional yogurt smoothies formulated with beneficial boosts. All Fruit Harmony - Dairy-free and soy-free smoothies made only with fruit, juice and ice. Twisted Fruits - Signature yogurt smoothies offered in new and innovative fruit-forward flavors. Just Kidd'n - Snack-sized fruit and yogurt smoothies, blended just for kids. Metabolic Fit 360™- A proprietary blend of protein, calcium and African Mango which supports metabolic balance and promotes healthy weight management. Dark Chocolate Mate - Finely ground, Brazilian roasted maté and dark chocolate; a delicious, rich, low-calorie flavor which also supplies a nice dose of antioxidants. Tropical Hibiscus - Finely ground, premium Nigerian hibiscus blossoms infused with natural pineapple and lychee; a bright and tropical low-calorie flavor and antioxidant boost. Green Tea Acai - Finely ground, premium green tea with açai berries, the Amazonian superfruit; a low-calorie antioxidant boost made with the best ingredients. Hurry to take advantage of Red Mango’s discount from now until July 5: Enjoy $2 Super Biotic Smoothies! Yup, just $2 (plus tax) for any regular size (16oz) Super Biotic smoothie all day, every day in store. No coupon or code required. Disclaimer: This was a sponsored post. I was compensated for my opinions and thoughts.